Today is Hina Matsuri! I still haven’t found any proper doll displays of ひな人形, the dolls I mentioned in yesterday’s post. I did, however, find these adorable creations at the Lawson’s by our house. Seriously, how adorable are they? It’s ridiculous! They’re almost too cute to eat, with their sweet little smiles. The little Empress on the right is wearing pink and a star shaped hat, and the little Emperor on the left looks dashing in green and his little…well…let’s ignore the hat, shall we? They’re one of my absolute favorite desserts too–Strawberry Daifuku! It’s lightly sweetened mochi (“Glutinous rice cake” according to my students’ dictionaries) wrapped around a lovely filling of sponge cake and sweet whipped cream. There’s a whole strawberry for heart, and overall are just sweet and yummy. The special thing about the Hina Matsuri version is of course the sugar heads, which are attached with a dollop of whipped cream. Delicious AND adorable! Want to learn more about Hina Matsuri? Check out Haiku Girl’s write up here! 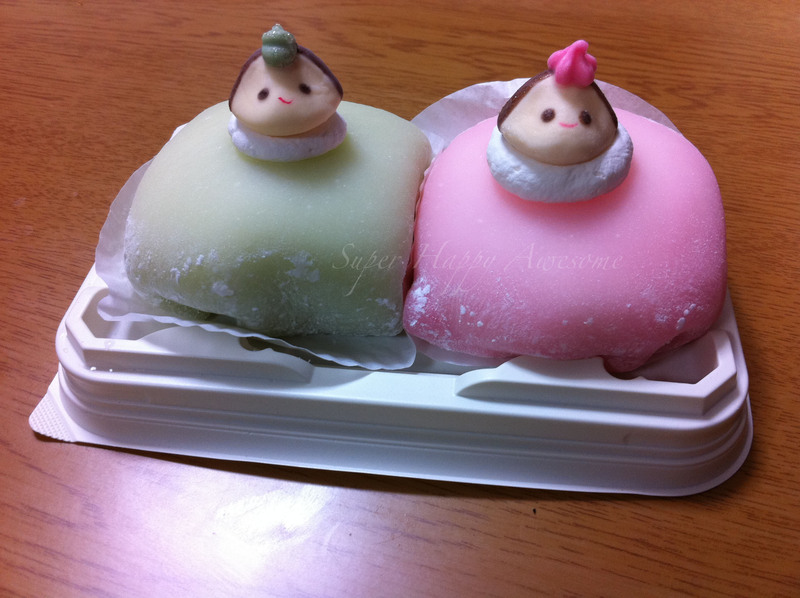 This entry was posted in Modern Traditions and tagged adorable, cake, cute, Doll Festival, dolls, Girl's Day, girly, hina matsuri, pink, sweet, tasty, tradition. Bookmark the permalink. My pleasure! And aren’t they sooooo adorable? Almost too cute to eat…almost! Haha, gluttonous is pretty accurate too! I was good though and shared these with Sean, so at least I wasn’t a tooootall glutton! Oh! Such an adorable treat. 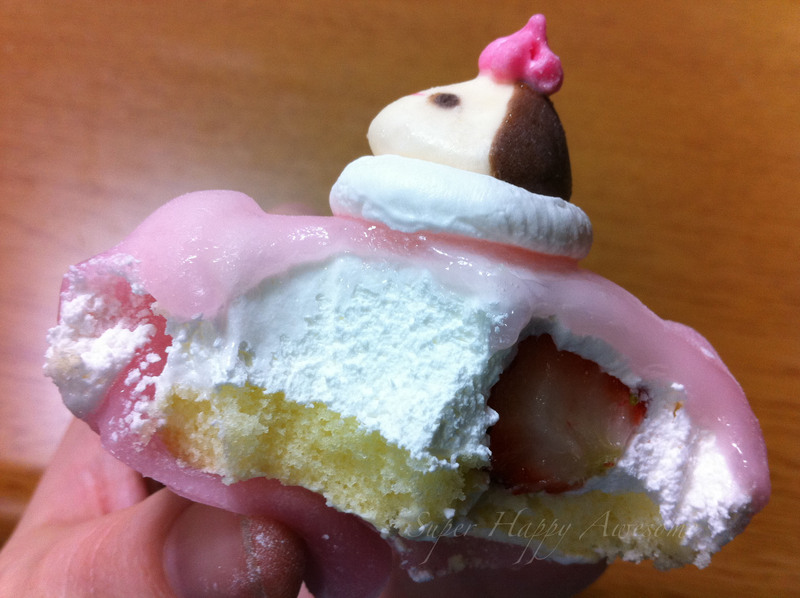 Strawberry daifuku with cake filling is pretty much the greatest thing ever. I’m so sorry I didn’t hit up Lawson’s sooner! I was so bummed they disappeared so quickly! That’s one thing that bugs me, though I guess it works–they’ve got me trained now to buy stuff immediately instead of waiting! Also, agreed–Strawberry Daifuku are awesome!